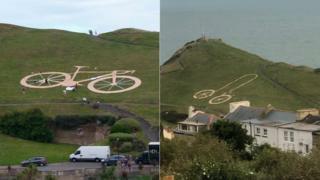 Project co-ordinator Seth Conway said: "Ilfracombe had a rude awakening this morning. "Some people obviously thought it would be fun to rearrange the spokes and the wheels." He added: "It's created quite a bit of a buzz and it's shone a bit more attention on to what the bike was there for." The Tour of Britain finishes in central London on Sunday.